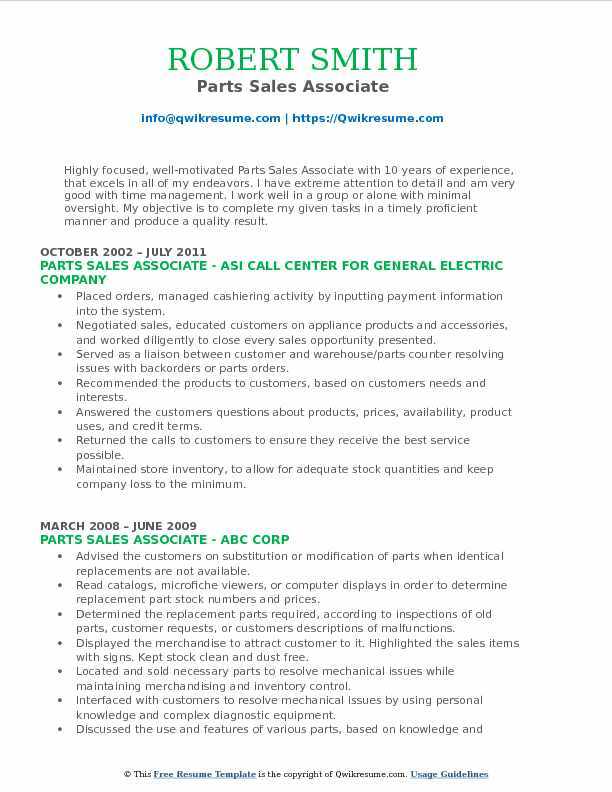 A Parts Sales Associate is basically responsible for selling various parts in hardware, repair, parts stores, mechanical or auto parts. 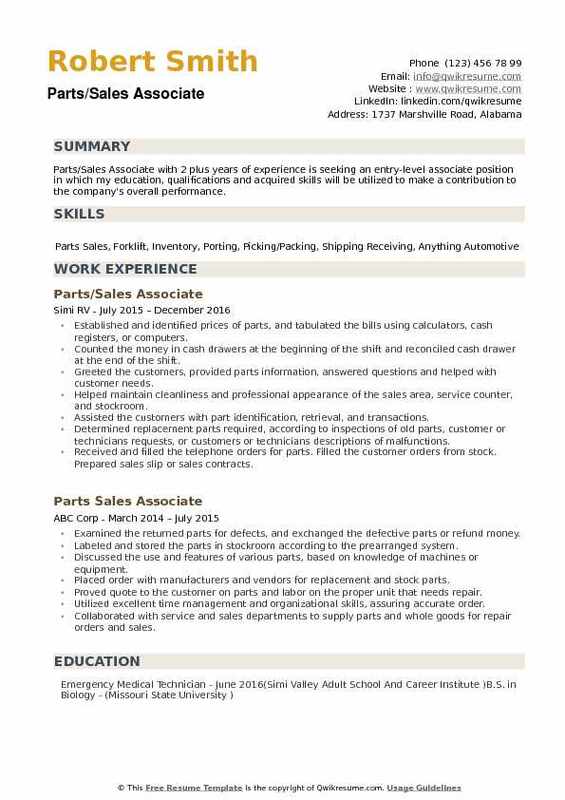 The primary responsibilities listed in the Parts Sales Associate Resume include – assessing the client’s needs, taking orders, helping customers find the right spare part, reading catalogs and determining new parts available in market, ensuring stocking of all parts, ordering new parts, determining the needed replacement parts, looking over machines and automotive to determine the needed part, recommending substitutions, examining defective parts and selling parts as required. 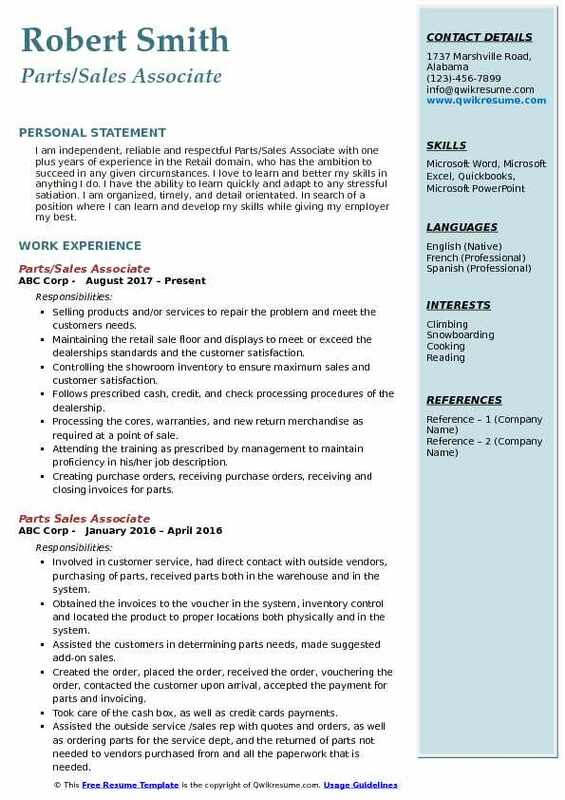 A well-drafted resume should focus on skills and qualifications like understanding of sales principles, proven work experience, a track record of crossing sales quota, a thorough knowledge of various spare parts and technical competencies, familiarity with inventory procedures, hands-on experience with various POS transactions and good memory power. Generally, a high school diploma or GED is expected to be seen on the eligible resumes; however, having an informal training with some familiarity in different auto and mechanical parts would be a good bid for the job. Headline : Hard-working and responsible Parts Sales Associate with 5 years of experience managing successful warehouses and storerooms. Strong results in resolving customer complaints. Team oriented and safety conscious, I am keen to apply my organizational skills to a team. Exceptional relationship builder with a proven talent for motivating teams. Assisted the walk-in customers in selecting required parts, suggest additional parts needed for the job, and up-selling, offer any specials and ensure the customer is exposed the full product line. Pulled the purchased parts from stock and created an invoice by computer or manual invoice. Collected the monies due if no cashiers are on, and accepted checks and credit card to credit departments requirements. Determined the availability and submitted an emergency order if requested by the customer. Determined if the part is a DSP or warehouse at the PDC and informed the customer if the part is more money. Informed the customers of “ special order” policy deposit required and/or freight policy, including fuel surcharge for non-stock parts, pick up at the local PDC. Assisted the outside sales representatives with their orders and ensured if and how they want to be delivered. Or order if not in stock. Set up orders for daily shipments, delivery, or pick up. Along with marking on the delivery board time parts were in the back and if delivery is hot or stock. Verified, “ will call “ and “back orders” files weekly and returned to vendors, or stock those items not required if the customer doesn't need the part. They must be done before the end of every month. 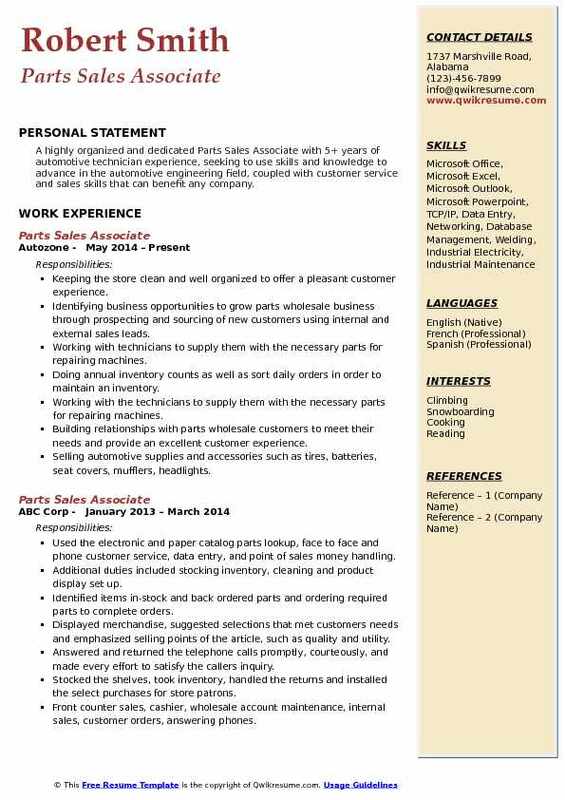 Summary : Accomplished and energetic Parts Sales Associate I with 13 years of experience with a solid history of achievement in closing sales. Areas of expertise include Reading schematics to find parts, Upselling to build the ticket and Making money. Goal-oriented Sales agent dedicated to high levels of customer satisfaction and meeting aggressive business goals. Providing customer assistance by selling parts to retail and wholesale customers. Ensuring a positive relationship with customers continues through friendly, knowledgeable, and helpful staff. Ensuring that customers' information is entered into the company's DMS system whenever possible. Ensuring the parts department is swept and dusted daily, ensuring that all inventory is fronted and presentable, maintaining a clean and organized work area. Preparing and processing the purchase orders as directed by the parts manager. Assisting in maintaining inventory, pricing, cost, bin locations, etc. assisting in matching vendors invoices with packing slips. Conducting cyclical inventories as directed by the parts manager. Maintaining the pricing margins. Preparing quotes for custom truck accessories and hitch installation. Assisting the service techs in finding need parts and charging to the repair orders. Summary : Parts Sales Associate with 11 years of experience is seeking to obtain a challenging position in a progressive organization, with ambitions toward further professional growth and advancement within the organization. Tasked with filling orders for body shops, service shops, our own techs, and the customer who came to the dealership or called on the phone. Involved in ordering and maintaining stock needed for day to day operation. Performing the component troubleshooting on customer autos - diagnosed battery, alternator, starter problems. Providing the trustworthy advice to customers seeking auto parts - promoted accessory and add-on sales. Demonstrating the equipment to customers and explaining the functionality of the equipment. Discussing the use and features of various parts, based on knowledge of equipment. Examining the returned parts for defects, and exchange defective parts or refund purchase. Determining replacement parts required, according to inspections of old parts, customer requests, or customers descriptions of malfunctions. 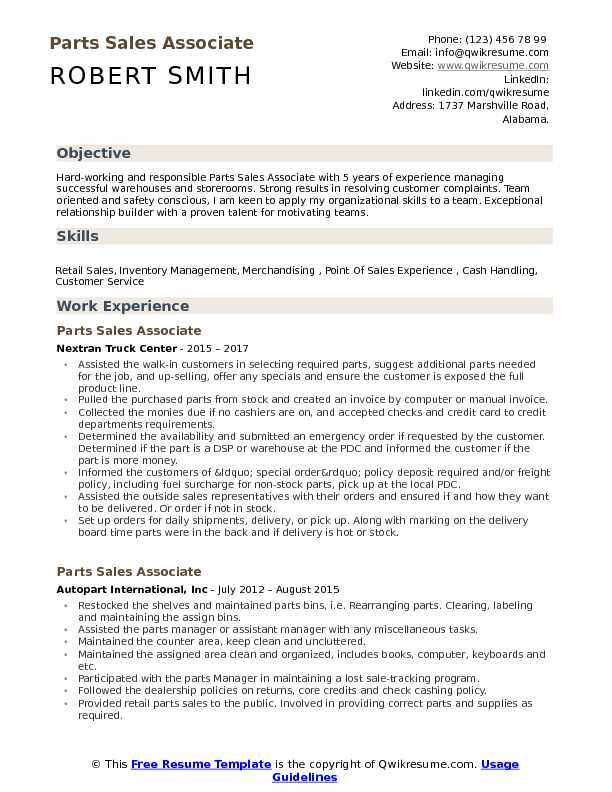 Objective : Parts Sales Associate with 3 years of experience in the Retail domain is seeking to obtain a position where my skills in communication and problem solving will be fully utilized as well as learn new and innovative skills to improve my work experience. Responsible for working with a team of sales coach teams on the proper execution of key and service professionals. Met and exceeded the aggressive sales goals desired behaviors and service targets. Performed daily reports, balancing cash. Spent time on the sales floor, greeting continually improve parts sales. Directed the customers helping them to the appropriate performance, operational excellence and areas of the center, and ensuring that the associate proficiency. Reviewed and processed the customer transactions, such as deposits, payments, and inquiries etc. Ensured that customers and technicians obtain the correct parts for the job and that they receive them in a timely manner. Converse with customers by telephone to provide information about products or services, take or enter orders, and cancel orders. 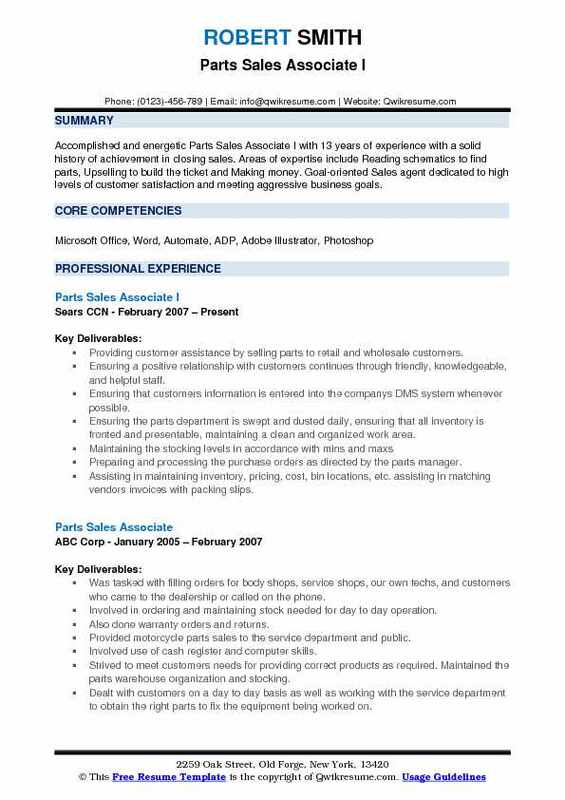 Objective : I am independent, reliable and respectful Parts/Sales Associate with one plus years of experience in the Retail domain, who has the ambition to succeed in any given circumstances. I love to learn and better my skills in anything I do. I have the ability to learn quickly and adapt to any stressful satiation. I am organized, timely, and detail orientated. In search of a position where I can learn and develop my skills while giving my employer my best. Selling products and/or services to repair the problem and meet the customer's needs. Maintaining the retail sale floor and displays to meet or exceed the dealership's standards and the customer satisfaction. Controlling the showroom inventory to ensure maximum sales and customer satisfaction. Follows prescribed cash, credit, and check processing procedures of the dealership. Processing the cores, warranties, and new return merchandise as required at a point of sale. Attending the training as prescribed by management to maintain proficiency in his/her job description. Creating purchase orders, receiving purchase orders, receiving and closing invoices for parts. Working with outside sales representatives to fulfill parts orders. Answering high call volume while providing excellent customer service. Highly skilled in handling customers parts requirements in terms of both sales and services. Verifying shipments against orders. 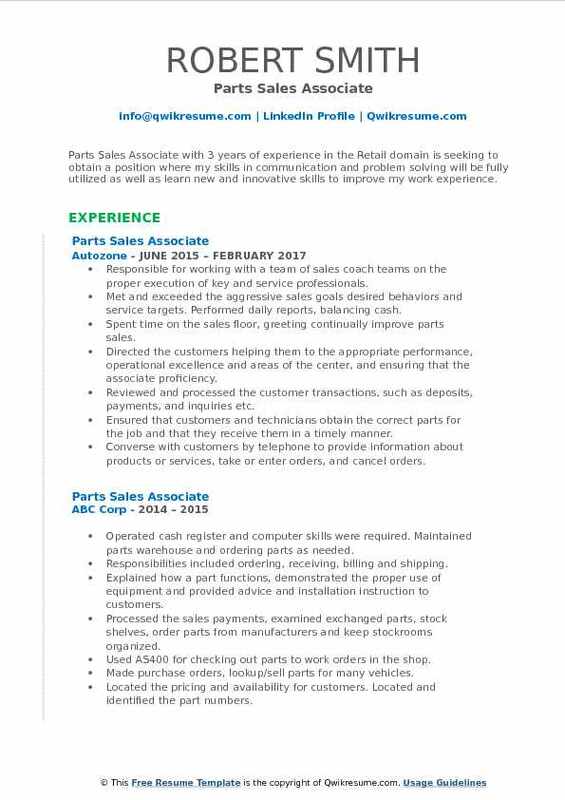 Summary : Parts Sales Associate II with 15 years of experience is looking to obtain a position in a Sales field to utilize my management experience, sales experience, and communication skills. Skills : Great Communication, Knowledgeable With Computer Programs And Office Machines. Selling the air conditioning equipment and parts while maintaining a minimum of a million dollars in sales for the year. Responsible for providing top quality customer service, handling customer calls, inquiries, quote prices, process customer orders over the counter and over the telephone. Responsible for maintenance of the showroom, including stocking shelves, merchandising, inventory maintenance, warehouse support, including shipping and receiving. Responsible for emergency deliveries to customers shops or job sites. Following and adhering to all safety, health, security and environmental standards. Effectively communicating the features and benefits of the products and actively promote our private label brand. Establishing and maintaining good relations with customers by providing prompt and courteous service for all customers and potential customers of the branch, including walk-in and telephone calls. 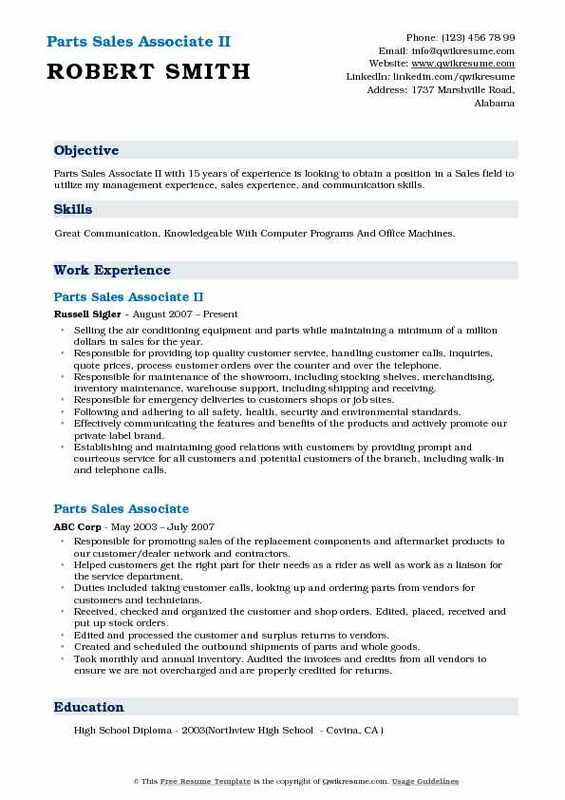 Summary : Highly focused, well-motivated Parts Sales Associate with 10 years of experience, that excels in all of my endeavors. I have extreme attention to detail and am very good with time management. I work well in a group or alone with minimal oversight. My objective is to complete my given tasks in a timely proficient manner and produce a quality result. Placed orders, managed cashiering activity by inputting payment information into the system. Negotiated sales, educated customers on appliance products and accessories, and worked diligently to close every sales opportunity presented. Served as a liaison between customer and warehouse/parts counter resolving issues with backorders or parts orders. Recommended the products to customers, based on customers needs and interests. Answered the customers' questions about products, prices, availability, product uses, and credit terms. Returned the calls to customers to ensure they receive the best service possible. Maintained store inventory, to allow for adequate stock quantities and keep company loss to the minimum. Assisted the customers with parts requests, and provided a recommendation on what may be needed to get the complete job. Looked up parts for customers and selling equipment. Also assembled units and took care of equipment for repair. 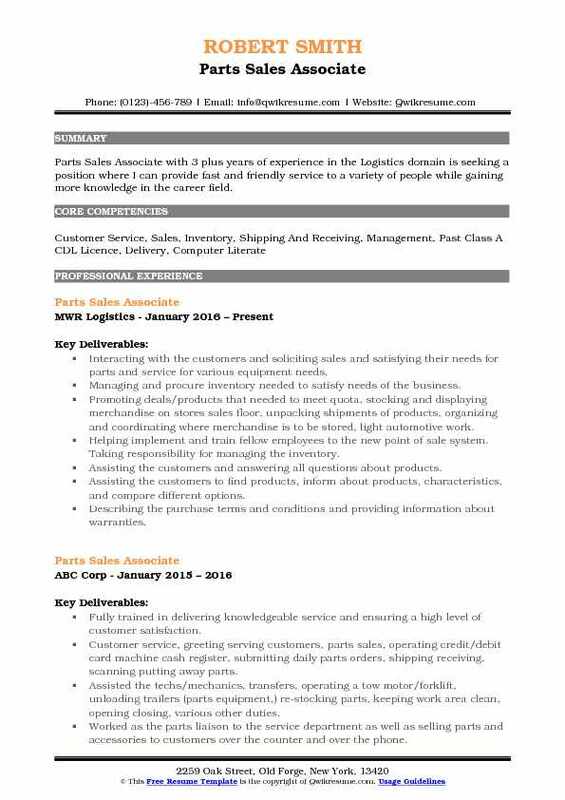 Objective : Parts Sales Associate with 3 plus years of experience in the Logistics domain is seeking a position where I can provide fast and friendly service to a variety of people while gaining more knowledge in the career field. Interacting with the customers and soliciting sales and satisfying their needs for parts and service for various equipment needs. Managing and procure inventory needed to satisfy needs of the business. Promoting deals/products that needed to meet quota, stocking and displaying merchandise on stores sales floor, unpacking shipments of products, organizing and coordinating where merchandise is to be stored, light automotive work. Helping implement and train fellow employees to the new point of sale system. Taking responsibility for managing the inventory. Assisting the customers and answering all questions about products. Assisting the customers to find products, inform about products, characteristics, and compare different options. Describing the purchase terms and conditions and providing information about warranties. Explaining and demonstrating the products to customers to help them make a purchase. Headline : A highly organized and dedicated Parts Sales Associate with 5+ years of automotive technician experience, seeking to use skills and knowledge to advance in the automotive engineering field, coupled with customer service and sales skills that can benefit any company. Keeping the store clean and well organized to offer a pleasant customer experience. Identifying business opportunities to grow parts wholesale business through prospecting and sourcing of new customers using internal and external sales leads. Working with technicians to supply them with the necessary parts for repairing machines. Doing annual inventory counts as well as sort daily orders in order to maintain an inventory. Working with the technicians to supply them with the necessary parts for repairing machines. Building relationships with parts wholesale customers to meet their needs and provide an excellent customer experience. Selling automotive supplies and accessories such as tires, batteries, seat covers, mufflers, headlights. Determining the make and year of the automobile and found stock number of item in the catalog. Providing the customers with needed information and offer additional sales opportunities. 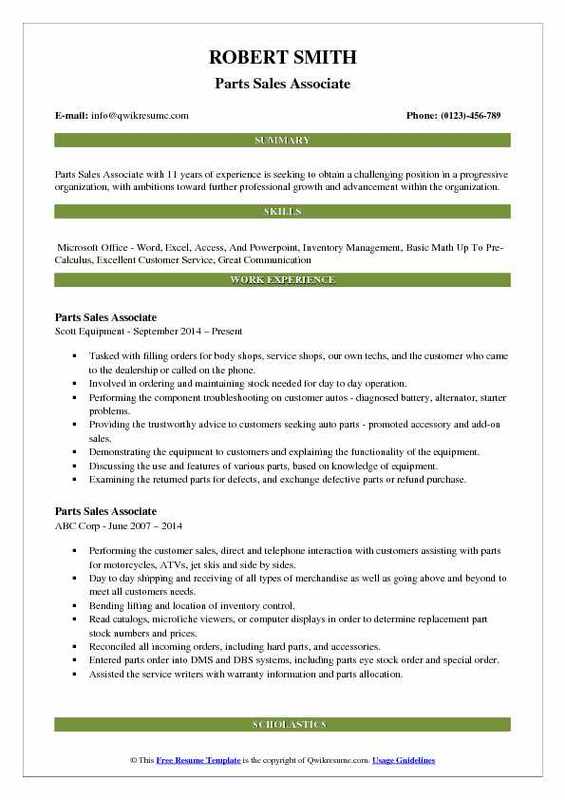 Objective : Parts/Sales Associate with 2 plus years of experience is seeking an entry-level associate position in which my education, qualifications and acquired skills will be utilized to make a contribution to the company's overall performance. Established and identified prices of parts, and tabulated the bills using calculators, cash registers, or computers. Counted the money in cash drawers at the beginning of the shift and reconciled cash drawer at the end of the shift. Greeted the customers, provided parts information, answered questions and helped with customer needs. Helped maintain cleanliness and professional appearance of the sales area, service counter, and stockroom. Assisted the customers with part identification, retrieval, and transactions. Determined replacement parts required, according to inspections of old parts, customer or technicians requests, or customers or technicians descriptions of malfunctions. Received and filled the telephone orders for parts. Filled the customer orders from stock. Prepared sales slip or sales contracts. Received the payment or obtain credit authorization.